ItemI-51984 - Barkerville; box 10, file 318. ItemI-51985 - "BC Pioneers, Mrs. R. Maynard, Photo. "; composite photo, pictures numbered, but no list available; box 13, file 417. ItemI-51986 - Unidentified downtown street scene, wide-angle lens; box 19, file 649. ItemI-51987 - "Sprays from the Gem Fountain"; composite photo of infants, box 14, file 465. 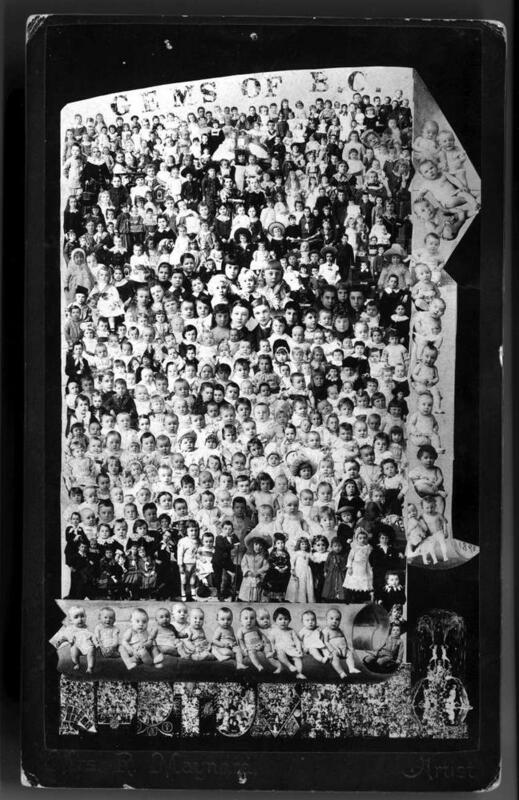 ItemI-51988 - "Gems of BC"; photo composite of infants and young children; Box 14, File 466. Item I-51988 - "Gems of BC"; photo composite of infants and young children; Box 14, File 466. Modern copy prints are available for works in the “Gems of British Columbia" composite series, as well as original studio portraits of children and babies featured in the final montage image(s). Available here are reproductions from original glass plate negatives, masked or edited versions of a print, and legacy copy prints. Other formats are available for the following “Gems of British Columbia”: 1881 (HP#018428); 1882 (HP#093165, HP#093679), 1883 (HP#093185, HP#093160), 1885 (HP#093230), 1887 (HP#054839) and 1889 (HP#093170), 1890 (HP#094123), 1891 (HP#093169), 1893 (HP#093182, HP#093683), and 1895 (HP#093678 and HP#093684). Some of these reproductions include annotations. Please contact the BC Archives to determine the access status of these reference materials. Item is in the public domain. Published articles from trade publications including the St. Louis and Canadian Photographer relating to other works in Hannah Maynard’s “Gems of British Columbia" series in 1885 and 1886, are available. St. Louis and Canadian Photographer is held by the University of Victoria Libraries, University of British Columbia Library, and Simon Fraser University Library. Other titles such as The Practical Photographer also contain press and publicity for the “Gems" series in May 1894. The Practical Photographer is held by Library and Archives Canada . For materials relating to alternative print versions of “Gems of British Columbia" series, see the BC Archives Photograph Collection. PR-1259 Maynard family collection holds the “Gem” for 1885 (see MS-2951). A number of original prints for other works in the “Gems of British Columbia" composite series are held in additional private record collections. See the Agnes Deans Cameron fonds for the "Gem" for 1894 (HP#093677. Described as PR-1365. See also the Todd, Gillespie family fonds for the “Gem” for 1883 (HP#054838), and for 1887 (HP#054839). Described as PR-2005. For the “Gem” for 1880 (HP#93180), and another undated work in the annual series, see PR-0356 Newcombe Family fonds (MS-2964 Photographs and sketches). For “Gems of British Columbia" works where miniature portraits of multiple baby and child portraits are superimposed onto objects such as plants (HP#92015), see PR-1259 Maynard family collection (MS-2951). For shells (HP#93366), see the BC Archives Photograph Collection. Mrs. R. Maynard was an artist, as well as a photographer. She was known for producing experimental works that involved photographic techniques such as double and multiple exposures, photo-sculptures, as well as composite and cut-and-paste montage imagery. The "Gems of British Columbia" series features portrait montages of selected children, largely Anglo-European subjects as well as a number of sitters from early Chinese and Black pioneering families, photographed throughout the year. These were sent as New Year's greeting cards to clients from 1881 until about 1895. In the 1880s, these composite photographs, which sometimes incorporated photo sculptures (also known as “Living Sculptures”) were published annually in the trade publication St. Louis Photographer (also known as St. Louis and Canadian Photographer). Additional documentation regarding documentation on Hannah Maynard’s photographic works including the "Gems of British Columbia" series can be found in the Maynard family research files. Resources to provide information on the photographs are available. This material was created by current and past staff and researchers of BC Archives and includes biographical, contextual, and photographic research information. Please contact the BC Archives to determine the access status of these records.